Convert DVR MS to MP4 with its converter. Convert PPT to PDF/DVD/AVI with PPT converter. Burn ISO to CD/DVD with ISO to CD/DVD burner. How to convert DVD to iPod MP4 video and M4A audio on Mac ? After the movie is imported, you can see all the chapters and titles in it, and then you can check the ones you want to convert. If you want to convert the whole movie, you can just keep all the titles or chapters checked. Select the iPod Video format from the Format drop-down list (Besides DVD to iPod video conversion, it can even rip DVD audio to iPod). 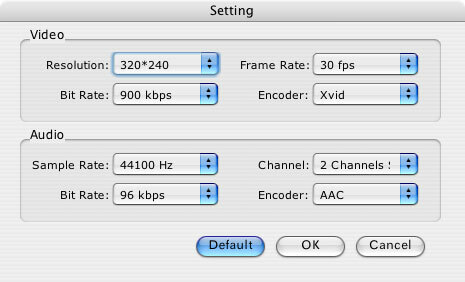 Click the Settings button to set encoding settings including video resolution, frame rate, bit rate and video encoder, audio encoding settings including sample rate, channel, bit rate and audio encoder. Name each title/chapter in the Output Filename field, and select the subtitle and audio track for the titles/chapters. Note: You can check the “Merger into one file” option to join all the selected DVD titles/chapters into one file instead of creating a separated file for each title/chapter. Step4. Click the Start button to start the conversion. And now you can just go talk a walk and wait till the conversion is completed. After that, you can just transfer the created files to your Apple TV. If you DVD video has black sides, you can use this Crop function to remove them. 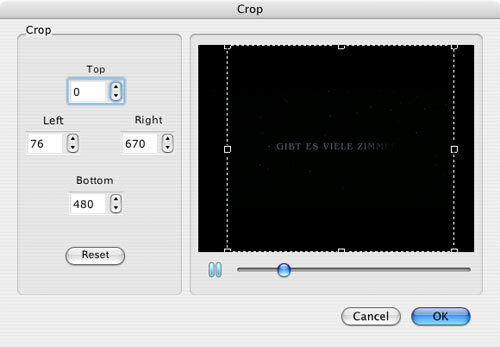 Click the Crop icon to open the Crop window, and set the crop area by dragging the crop frame or setting the four crop parameters (Top, Bottom, Left and Right). If you are not content with the original effect, you can click the Effect icon to set the video brightness, contrast, saturation, and audio volume. 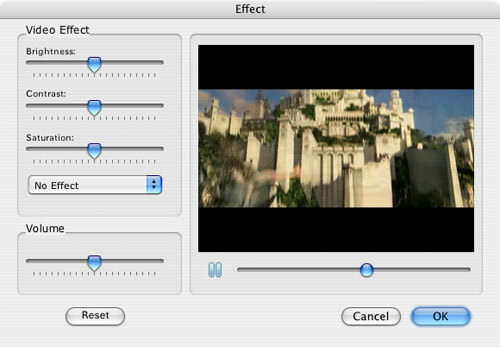 You can also choose to apply a special effect to your movie video from effects including Gray, Emboss and Negative.